No Impact Man: Do cars make us fat? Do cars make us fat? Look at the graphs. The red line shows the rates of obesity for various countries. The green line shows the percentage of trips made by walking, cycling and public transit (as opposed to cars). What you can see is that the less the citizens of a country use cars--the more they use their legs--the less fat they are. 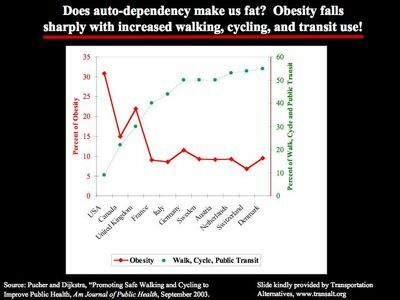 Using cars less cures obesity epidemics! We don't actually need graphs to tell us this, right? It makes total sense. If you walk instead of drive, you use more calories. Walking and cycling is healthier for people than driving. Walking and cycling is also healthier for the planet than driving. Use cars less and you get to reduce global warming and be less fat. What an amazingly wonderful synergy. I've been thinking about this a lot: If you believe in any sort of a Creator or Oneness or Universal Truth or God, how likely would it be that That Which Cannot Be Named would design a universe where the needs of people and the needs of the planet conflict with each other? Not too likely, in my book. Only a low-IQ Creator would design a universe that worked that way. So the way I figure it, it is no surprise, if you believe in the Great Designer, that the design is based on the idea that what is good for the planet is also good for the people. Leaving cars at home is good for the planet and good for the people. So on an individual level, I like to ride my bike. On a community level, I like to promote the idea that our transportation systems should be built and designed in a way that makes biking, walking and public transit safe and effective. Am I trying to suggest that we should take everyone's cars away? No. I just want a transportation system that makes biking, walking and public transit so attractive that none of us can be bothered with our expensive, people-fattening, traffic-jam-causing, planet-destroying cars anymore. The slide above was kindly supplied by Transportation Alternatives.